If you’re trying to make any kind of change in your life, whether it’s working out more, eating healthier or improving your mood, then many would suggest tracking what you do throughout the day to see where and how you can make the necessary changes to your routine. We’ve come across a number of tracking services before, like Buddy and Grateful160, but uMotif has to be one of the most intuitive and simple. To get started with uMotif you create an account and then can rate how you did in each area of your life. You can choose to score the different sections between 1 and 5 and that can be from terrible to terrific, or you could assign your own quantities or meanings to each. You can (of course) share your days, ratings and the flower images they create to Facebook and Twitter if you’re looking for encouragement, or keep everything private if you’re not in the habit of telling your mates what you’ve been up to ALL of the time. uMotif isn’t a really detailed tracking tool, so if you’re looking for a way of keeping extensive notes or focusing on just your eating habits or just your fitness then there are probably better services out there for you. However, for a simple tool that’s designed to look good and be super simple to use, then uMotif is a perfect option. Check out www.umotif.com to have a go yourself. 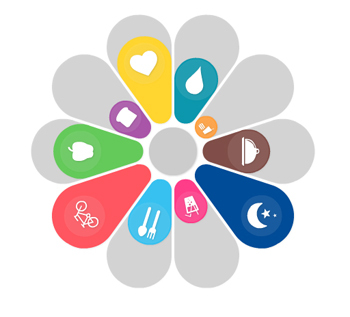 One Response to "uMotif is a simple and colourful wellbeing tracker"
Looks fantastic! An intuitive, simple design.